In exactly one week, the European Parliament will hold a crucial debate and vote on a proposal so terrible, it can only be called an extinction-level event for the Internet as we know it. At issue is the text of the new EU Copyright Directive, which updates the 17-year-old copyright regulations for the 28 member-states of the EU. It makes a vast array of technical changes to EU copyright law, each of which has stakeholders rooting for it, guaranteeing that whatever the final text says will become the law of the land across the EU. The Directive was pretty uncontroversial, right up to the day last May when the EU started enforcing the General Data Protection Regulation (GDPR), a seismic event that eclipsed all other Internet news for weeks afterward. On that very day, a German MEP called Axl Voss quietly changed the text of the Directive to reintroduce two long-discarded proposals — "Article 11" and "Article 13" — proposals that had been evaluated by the EU's own experts and dismissed as dangerous and unworkable. Under Article 11 — the "link tax" — online services are banned from allowing links to news services on their platforms unless they get a license to make links to the news; the rule does not define "news service" or "link," leaving 28 member states to make up their own definitions and leaving it to everyone else to comply with 28 different rules. 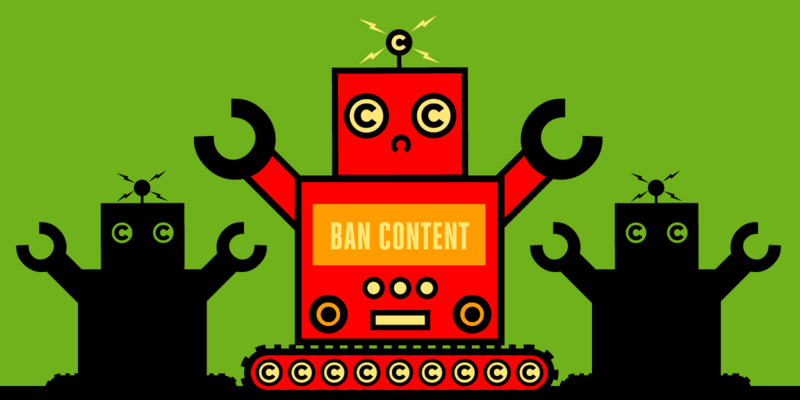 Under Article 13 — the "censorship machines" — anyone who allows users to communicate in public by posting audio, video, stills, code, or anything that might be copyrighted — must send those posts to a copyright enforcement algorithm. The algorithm will compare it to all the known copyrighted works (anyone can add anything to the algorithm's database) and censor it if it seems to be a match. These extreme, unworkable proposals represent a grave danger to the Internet. The link tax means that only the largest, best-funded companies will be able to offer a public space where the news can be discussed and debated. The censorship machines are a gift to every petty censor and troll (just claim copyright in an embarrassing recording and watch as it disappears from the Internet! ), and will add hundreds of millions to the cost of operating an online platform, guaranteeing that Big Tech's biggest winners will never face serious competition and will rule the Internet forever. That's terrible news for Europeans, but it's also alarming for all the Internet's users, especially Americans. The Internet's current winners — Google, Facebook, Twitter, Apple, Amazon — are overwhelmingly American, and they embody the American regulatory indifference to surveillance and privacy breaches. But the Internet is global, and that means that different regions have the power to export their values to the rest of the world. The EU has been a steady source of pro-privacy, pro-competition, public-spirited Internet rules and regulations, and European companies have a deserved reputation for being less prone to practicing "surveillance capitalism" and for being more thoughtful about the human impact of their services. In the same way that California is a global net exporter of lifesaving emissions controls for vehicles, the EU has been a global net exporter of privacy rules, anti-monopoly penalties, and other desperately needed corrections for an Internet that grows more monopolistic, surveillant, and abusive by the day. Many of the cheerleaders for Articles 11 and 13 talk like these are a black eye for Google and Facebook and other U.S. giants, and it's true that these would result in hundreds of millions in compliance expenditures by Big Tech, but it's money that Big Tech (and only Big Tech) can afford to part with. Europe's much smaller Internet companies need not apply. It's not just Europeans who lose when the EU sells America's tech giants the right to permanently rule the Internet: it's everyone, because Europe's tech companies, co-operatives, charities, and individual technologists have the potential to make everyone's Internet experience better. The U.S. may have a monopoly on today's Internet, but it doesn't have a monopoly on good ideas about how to improve tomorrow's net. The global Internet means that we have friends and colleagues and family all over the world. No matter where you are in the world today, please take ten minutes to get in touch with two friends in the EU, send them this article, and then ask them to get in touch with their MEPs by visiting Save Your Internet. There's only one Internet and we all live on it. Europeans rose up to kill ACTA, the last brutal assault on Internet freedom, helping Americans fight our own government's short-sighted foolishness; now the rest of the world can return the favor to our friends in the EU.